To produce a trophy size grizzly bear, you need a few things. A good food supply, low hunting pressure and a guide that knows the land. With those three things, you are more likely to claim a trophy size Grizzly Bear. AlaskaChallenge Guide Service is located in one of the best areas you can ask for when it comes to Trophy Size Grizzly Bears. In Alaska, a 7' 2" Grizzly Bear is considered on average to be a large Grizzly bear. 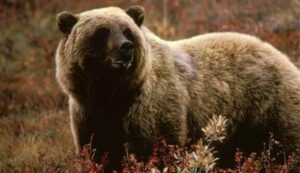 In the Galena area, our Large Grizzly Bears on average are over 8'. This is due to the number of Salmon streams and the highest population of Moose for the bears to feed on. There is very little hunting pressure in Galena as well as an overpopulation of Grizzly bears making this the best place to take a Trophy Sized bear. 90% of the Bears we took last season made the record books.